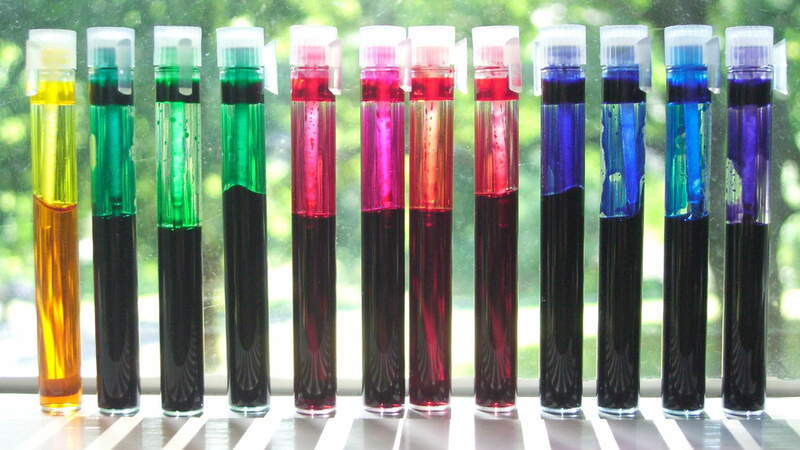 Three of those vials contain the original CMY inks, taken from a trio of small generic inkjet refill bottles. 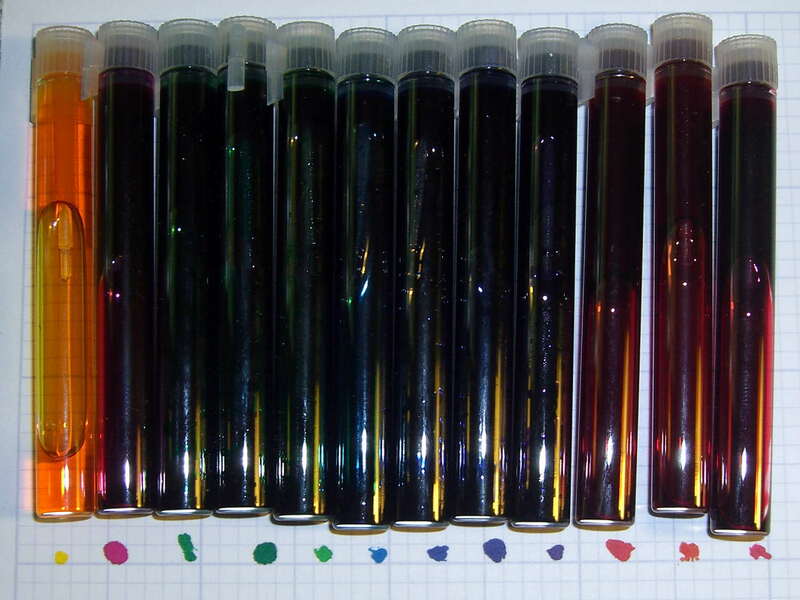 Mixing 1:1 ratios of two inks produces the expected red / blue / green primaries. Six other colors came from 2:1 blends of two inks and, except maybe for that purple over on the right of the top picture, aren’t worth the aggravation; plotter drawings don’t score higher for having a rich color palette. In principle, I could dilute the mixes with water (alcohol? vodka?) to produce less saturated colors, but for plotter ink absolutely nothing exceeds like excess. The CMY and 1:1 (= 0.5 ml each) vials should contain 1.0 ml and the 2:1 vials hold 0.9 ml (= 0.3 + 0.6 ml), but I didn’t sweat the small stuff and there was some, ah, spillage along the way. The vials are 1.5 ml perfume sample vials from the usual eBay supplier: 50 of the things (with 10 squeezy plastic 3 ml pipettes) set me back nine bucks delivered. Refilling a plotter pen requires maybe 0.05 ml, so each vial holds 20-ish refills with plenty of headroom. Memo to Self: Do not fiddle with magenta ink immediately before chopping the supper vegetables.